Captain Scarlet and the Mysterons, often referred to as Captain Scarlet, is a 1960s science-fiction television series produced by the Century 21 Productions company of Gerry and Sylvia Anderson, John Read, and Reg Hill. First broadcast on ATV Midlands from September 1967 to May 1968, it has since been transmitted in more than 40 other countries, including the United States, Australia, New Zealand, and japan. Characters are presented as marionette puppets alongside scale model sets and special effects in a filming technique that the Andersons termed "Supermarionation". This technology incorporated solenoid motors as a means of synchronising the puppet's lip movements with pre-recorded dialogue. 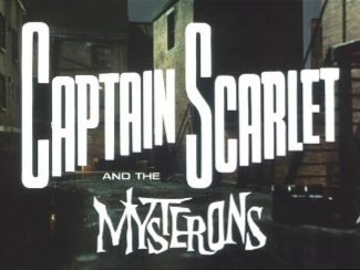 Set in 2068, Captain Scarlet presents the hostilities between Earth and a race of Martians known as the Mysterons. After human astronauts attack their city on Mars, the vengeful Mysterons declare war on Earth, initiating a series of reprisals that are countered by Spectrum, a worldwide security organisation. Spectrum boasts the extraordinary abilities of its primary agent, Captain Scarlet. During the events of the pilot episode, Scarlet acquires the Mysteron healing factor of "retro-metabolism" and is thereafter considered to be virtually "indestructible", being able to recover fully from injuries that would normally be fatal.